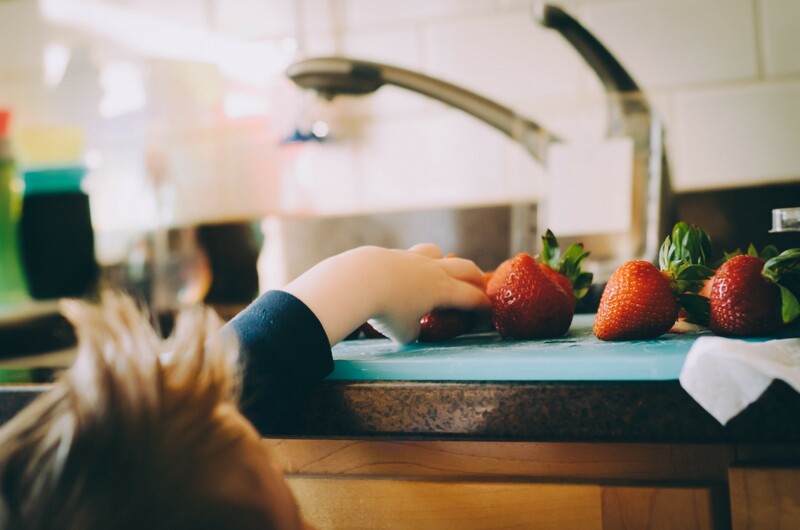 Strawberry Snatcher by Kelly Sikkema. Worldwide copyright license via Unsplash. 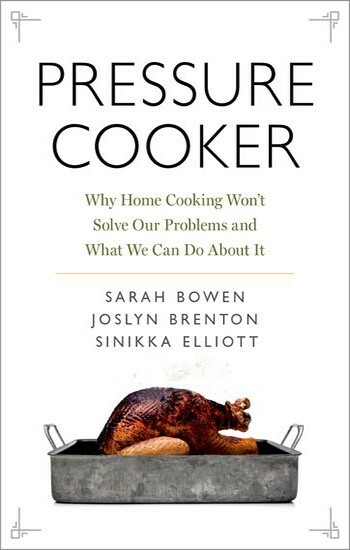 In the following excerpt from Pressure Cooker: Why Home Cooking Won’t Solve Our Problems and What We Can Do About It, authors Sarah Bowen, Joslyn Brenton, and Sinikka Elliott examine the challenges many families face when trying to live up to the “home-cooked meal” ideal. Like many Americans, Leanne spends a lot of time thinking about and preparing food. She doesn’t subscribe to any parenting or cooking magazines, and she doesn’t read the “mommy internet,” but she’s well aware of the dominant messages about what mothers should be doing in the kitchen. Good moms cook for their children. And not just any food, but food that is appealing, healthy, and made from scratch. Leanne has embraced many of these messages. She apologizes for using canned food, saying she’d prefer fresh or frozen. She cares deeply about cooking and eating. But these days, she doesn’t have much money to spend on food. When the cupboards run low, as they often do, Leanne skips a meal so the kids have enough to eat. When her food stamps run out, Leanne calls someone for a ride across town to the food pantry. But help from the pantry comes at a cost. She waits around, her three children by her side, for her number to be called. She never knows what kind of food she will get, which makes it hard to plan meals or work around her family’s preferences. Being poor chips away at Leanne’s pride. The kitchen restores her dignity and her confidence. But it doesn’t solve her problems. And it creates new dilemmas, like when she can’t reliably get the food she needs to make home- cooked meals, the kind of meals that good mothers are supposed to make for their children. Now, perhaps more than ever, food is a matter of national concern and a political and cultural flashpoint. One out of every eight people in the United States doesn’t have enough to eat. Food recalls, conflicting nutritional advice, and unpronounceable ingredients make people anxious about the food they’re ingesting. The impacts of large-scale food production also raise alarm bells. There is also panic about our growing waistlines. Since the 1980s, rates of obesity have doubled among adults and tripled among children, which many people attribute to the ubiquity of cheap, processed foods and the fast-food restaurants that stretch from coast to coast. Not everyone agrees about how to reform the food system and restore the nation’s health, but one message often rises above the din: We need to get back in the kitchen. From celebrity chefs to home cooks, lots of people seem to have the feeling that our country has lost its way and that returning to the dinner table will get us back to healthy kids and strong families. Michael Pollan, arguably the most influential foodie in the United States, implores us to slow down and rediscover the joy of cooking and eating together. Cooking is a meaningful act, Pollan says, that can deepen our connection to nature and to ourselves. Pollan’s message is inspirational, seeking to convert readers by appealing to the healing power of cooking. Other food reformers aren’t so gentle. They accuse people who fail to cook of being selfish, of neglecting their responsibilities as parents or citizens. Food reformers frame cooking from scratch not as a culinary choice or a hobby, but as an issue of morality. Home-cooked meals have acquired an almost mythical status. Yet it’s worth thinking for a moment about what it takes to put a home-cooked, foodieworthy meal on the table. At a minimum, it takes a working stove and enough money to pay the electric bill to run the stove. Poor families like Leanne’s are sometimes forced to make difficult choices: pay the electric bill or the rent? Buy groceries or pay a medical bill? The foodie ideal is based on the notion that food is, or should be, at the top of everyone’s priority list. Food matters to Leanne. It matters a lot. But so do other things. While she cooks, she’s totaling up how she is going to get through the month with the money she has and her kids clamor for her attention. Foodies often seem to assume that if we just take the time to prepare good food, families will flock to the table and contentedly eat it. However, as many weary parents can attest, a lot can go wrong at dinner. Even with cooking skills, money, and motivation, a lot of people find that achieving the foodie ideal of a home-cooked dinner is consummately out of reach. And yet many Americans feel the pressure to get it right. Excerpts and articles from Oxford University Press revealing insights into religion, culture, philosophy, and the arts.